My name is Sarah Graumann and my career in dental hygiene started 14 years ago. I have been working at The Gorman Center for Fine Dentistry for almost 12 years. A two-year break allowed me to attend the University of Minnesota to achieve my Masters of Science degree. During that break, I also had my son (youngest of two children) and committed time each day to writing a literature review that went on to be published in the Journal of Dental Hygiene in August 2013. I have greatly expanded my knowledge base by working with Dr. Gorman at The Gorman Center for Fine Dentistry and through extensive continuing education courses these past 14 years. I feel the biggest change to come about has been the importance of making patients aware of the oral/systemic (mouth/body) health connection. Although there has always been a connection between oral health and body health, emerging science confirms that eliminating and preventing inflammation and infection in the mouth is linked to better total health, longevity, and wellness. Dr. Gorman is a founding member of The American Academy for Oral Systemic Health (AAOSH), founded in 2010. This growing organization collaborates with physicians and is dedicated to getting the word out about the relationship between your oral health and overall health. 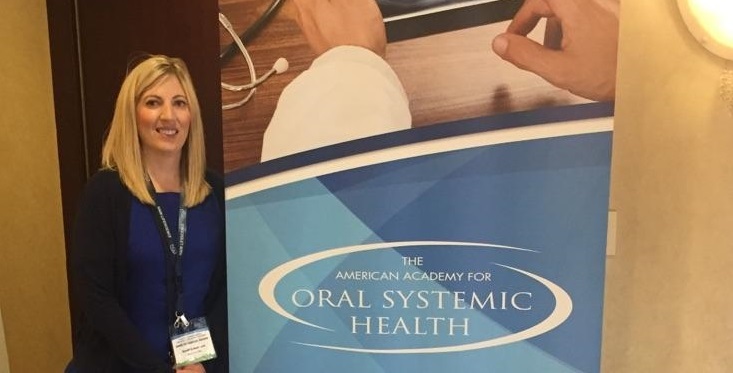 I was excited to attend the 6th annual AAOSH meeting in Salt Lake City, Utah in September to connect with dental and medical caregivers. Sometimes patients don’t realize why hygienists are concerned with bleeding gums. I often hear “My gums always bleed and that’s normal for me” or “I know I don’t floss as much as I should and I know that I have bleeding.” However, scientific evidence confirms gum tissue bleeding during your hygiene appointment is evidence of infection and inflammation that can spread to the rest of your body. Those who do an amazing job with their home care but still have persistent bleeding and inflammation may have something else going on in their body that is leading to this inflammation. Dr. Gorman often collaborates with patient’s physicians to achieve their best overall health. At the Gorman Center, we are focused on the overall health and well-being of our patients. We pay special attention to emerging information and continue to use the best technology and procedures to reduce your risk factors thereby promoting total body health. Studies show that committing to your regular dental hygiene appointments lowers the risk of heart attack and stroke. I welcome any of your questions and enjoy discussing oral health so please contact me online or call me at #651-483-5134.